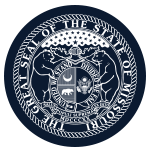 Mission: The Missouri Soil and Water Districts Commission formulates policies and general programs for the saving of Missouri soil and water by the soil and water conservation districts. Function: The Missouri Soil and Water Districts Commission formulates policies and general programs for soil and water conservation; receives and allocates or otherwise expends for the use of the soil and water conservation districts any funds appropriated by the legislature of this state for the use or benefit of such districts, including a soil and water conservation cost-share program; receives and properly conveys to the soil and water conservation districts any other form of aid extended to such districts by any other agency of this state;establishes rules and procedures for establishment and dis-establishment of districts;establishes rules for electing boards of supervisors; provides any assistance to districts as the commission may determine is appropriate for the saving of soil and water;promulgates rules and regulations. Compensation: Members receive reimbursement for realized and necessary expenses. Member Requirements: 6 members must be farmers; and 4 ex-officio members are the Dean of College of Agriculture, Univ. of Missouri; and Director of Department of Agriculture; Director of Department of Natural Resources and the Director of Department of Conservation.